My daughter, Betsy, was turning one and I decided to do a Twinkle, Twinkle, Little Star birthday theme. I didn't want it to feel too girly so I used mint, gold, black, and white as the color scheme. I wanted a simple theme that was fun for a first birthday. I saw a few fun ways to prepare food in star shapes and knew it was the perfect theme. I used Pinterest a lot and found that many other mamas had done a "twinkle, twinkle" theme, too. Thanks for the inspiration, Ashlee Proffit and Kirsten Krason! I like decorating with simple details. I usually pick color schemes that work with our home's decor. I DIYed the star garland above the food table. I used a star paper punch and glued them onto clear thread. I had the gold scallop bunting and gold sequin runner from a previous party and was excited to be able to use them again. 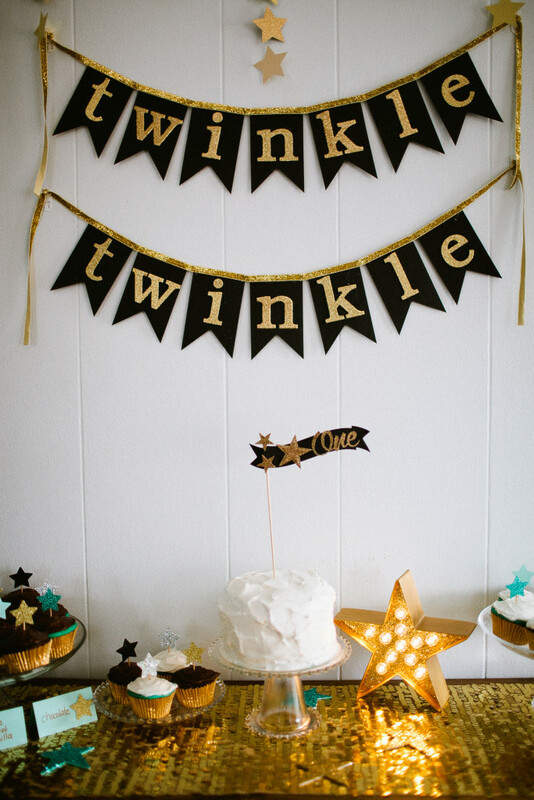 The "twinkle, twinkle" banners were homemade, too, using precut banner flags and gold chipboard letters from Michaels. I also made felt shooting stars, like these, as party favors for Betsy's baby friends. Each star had sparkly ribbons trailing from it. The babies loved waving them around! I loved the little party hat, even though Betsy was not as thrilled about wearing it! Choose a color scheme that works with things you already have and compliments your normal decor. Pingback: Kids in Party Hats! I would love to know where that star lamp is from! Meredith, I bought the star light from Michaels and painted it and added glitter. Where did you get her dress?! It’s exactly what I want for my daughter’s first birthday! Hi !! Did u make the hat urself?! Its lovely!! I can’t find a similar balloon anywhere. Did you make it yourself?